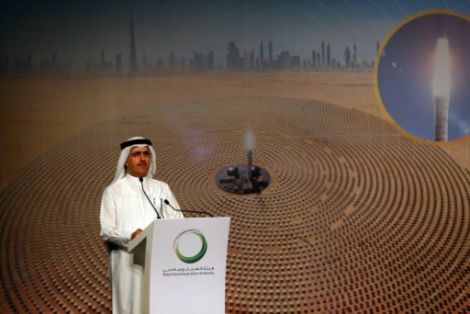 Dubai is showing that not only does it want its energy to be cleaner, but also bigger—it’s building the world’s largest concentrated solar plant (CSP), which will deliver 1000 MW by 2020. Announced Thursday, June 2, by the Dubai Water and Electric Authority (DEWA), the plant will be located in the Mohammed Bin Rashid Al Maktoum Solar Park, the largest single-site solar park in the world. The overall plans call for a total of five facilities, the first 200 MW of which is already being bidded out to international consultants. While current rates for CSPs are at around 15 cents per kilowatt hour, the DEWA is targeting 8 cents per kilowatt hour. No specific project cost has been revealed, but confirmed that the overall 5000 MW project within the solar park—including photovoltaic (PV) and CSP—would cost AED (Emirati Dirham) 50 billion ($13 billion). For that money, the solar park is expected to reduce 6.5 million tons of carbon emissions each year. The CSPs are different from the common photovoltaic panels used by smaller scale plants. It consists of circular rings of solar mirrors called heliostats that direct sunlight into a central collection tower where the sun’s rays power a steam turbine to generate electricity. The advantage of this system is that it can store energy even when there is no direct sunlight, storing power for 8 to 12 hours after generation. The solar park is a key component of Dubai’s Clean Energy Strategy 2050. In this moonshot endeavor, the emirate aims to generate 7% of total power from clean energy sources by 2020, 25% by 2030 and 75% by 2050. To do this, Dubai will not just be relying on solar energy. Its energy mix will include 61% from natural gas, 25% from solar energy, 7% from clean coal and 7% from nuclear power by 2030.